Swedish culture is rich in tradition. Traditions are influenced over countless generations by factors such as geography, geology and cultural exchange. Sweden's widely varying geography has for example meant that Swedes have had to adapt to widely varying environmental conditions, and therefore developed a rich tapestry of local tradition interwoven with national themes. Sweden's location - with the northernmost provinces reaching beyond the Arctic Circle, experiencing extremes of light and dark, long white winters and shorter intense summers, and the southern half surrounded by the milder waters of the Gulf Stream - has led to a wide range of local climates up and down this long, narrow country. Topography too impacts on culture. The mountains of Jamtland and Harjedalen for example, have affected local traditions quite differently than the open, flatter landscapes of Gotland and Skane. The Swedish culture has been influenced by the cultures of other countries. For example, the presence of many influential Germans in medieval Sweden accounts for why many of Sweden's traditional festivals, such as Midsummer (dancing around the maypole), St. Lucia and St.Martin's Goose"Martensgas" are modeled so closely on older German ones. The uniformity of many popular festive traditions can be attributed to the influence of the Christian church. Nearly all the traditional Swedish festivals have an ecclesiastical background, most dating back to medieval Catholicism, which was abolished by the Reformation in the 16th century. These days, people are free to choose whatever religion or denomination they wish, though we still enjoy Easter eggs and St. Lucia thanks to these medieval influences. The depth and variety of Sweden's cultural heritage has been inspired by two main sources - nature with its ever-changing, clearly defined seasons, and contacts with other cultures, from as far back as the Iron Age, through the Viking era up to the present day. Handicrafts from a significant part of Sweden's cultural heritage. The humble, wooden Dala horse is often seen as a symbol of Sweden, along with the exquisitely designed glassware of Smaland. Both these symbols can be found in homes around the world. But this is just the tip of the cultural iceberg. Sweden has much more to offer - from the Hoganas ceramics of western Skane in the south, to the finely carved wood, bone and textile handicrafts of the Sami people in northern Lapland. And in between the provinces in the heart of the country with their countless workshops full of weavers and spinners, gold and silver smiths, stonemasons, and woodcarvers. Besides the wealth of prehistoric cultural sites, there are many more dating from historic times - fortresses, castles and manor houses from the Middle Ages through to the 19th century. For example, Glimmingehus in the far south of the country is the best-preserved medieval fortress in Scandinavia. In the area around Lake Malaren there are many fine examples of castles and stately homes dating back to the era when Sweden was a great power in the 17th and 18th centuries. Medieval churches, large and small, are also an important part of Sweden's cultural heritage. There are enormous historic cathedrals in Uppsala, Västerås and Lund; while on Gotland there are many small village churches, each with its own special history. The Bergslagen area retains many fascinating relics from the iron industry's heyday. There are cultural sites where you can see entire iron-industry villages preserved in their original state, and witness how iron are used to be mined. At Falu Koppargruva and the Stora Museum in Falun, there is a unique copper-mining environment dating back to the 16th century. Another fascinating area, and listed as a World Heritage site, is the entire town of Visby on the island of Gotland, with its medical Hanseatic town center and fantastic walls. The old town in Stockholm, "Gamla Stan" is criss-crossed by winding cobbled alleyways, and is full of buildings dating from the 16th, 17th and 18th centuries. You can experience the magic of age-old traditions, historical sites and breathtaking settings in virtually every part of this unique country. 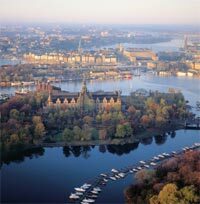 The most popular tourist destination is the Swedish capital, Stockholm. The grand old city by the water is known for its unique wonders such as the Vasa ship; its elegance and grandeur, typified by the royal Palace and surrounds, and its wonderfully preserved Old Town, "Gamla Stan", with 13th century roots, subterranean vaults, church spires and narrow, cobbled laneways. Just a short distance to the north of Stockholm, lies the town of Uppsala, with its immense Cathedral - not only Scandinavia's largest but also tallest church, Uppsala Cathedral was consecrated around 1260, and is still the most important center of the Swedish Church today. Uppsala is a university town, steeped in academic tradition. A walk through the old town, dominated by its churches, castle views and dignified old centers of learning, is balanced by open gardens, parks and canal views.